The latest version of the Tiled plugin adds per-layer Alpha and Color (Red, Green, and Blue) values, enabling even more flexibility in rendering .tmx files. 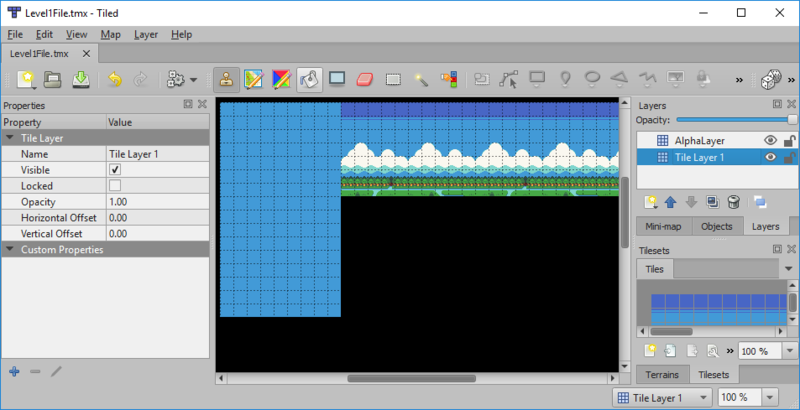 The Tiled program supports alpha values on each layer. Setting the alpha on a layer will automatically apply that alpha when the game runs. The latest plugin also adds the ability to change the color/alpha values in code. Since each layer is drawn independently, each layer can be adjusted on its own. For example, the following code shows how to adjust the alpha and color values of a map with 2 layers. Color values apply a Modulate (also called multiply) effect. For information on how Modulate works, see the Modulate page. Color values of 1 will result in the map being drawn without any modifications. A value of 0 will remove the particular color. 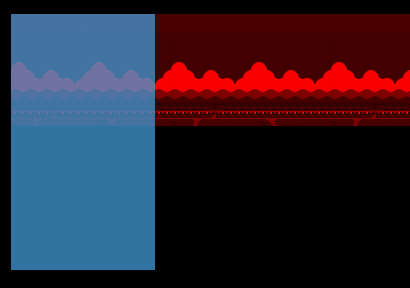 In the example above, Green and Blue are set to 0, which is why the map draws red. Version 1.7.0 of the Tiled plugin is available now, so you can start modifying your game’s tile map color and alpha values right away.